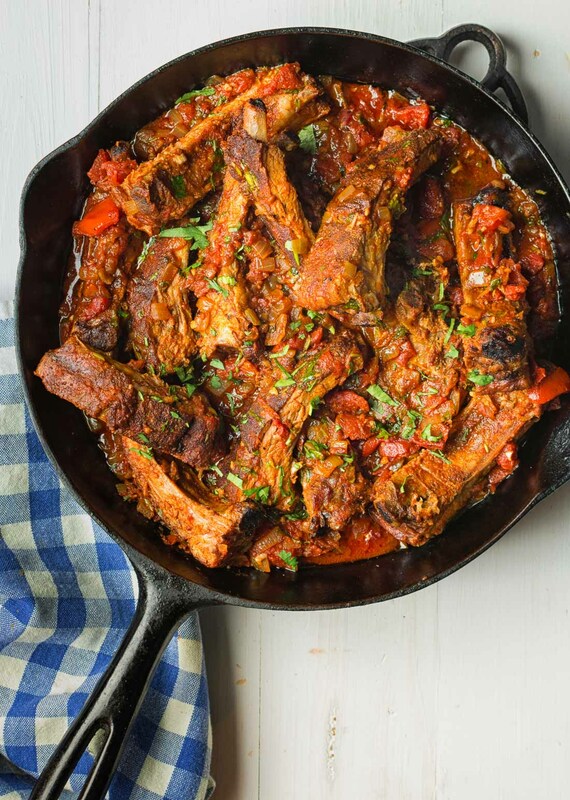 Mexican pork ribs. Chili. Tomato. Spice. Creamy cheese grits. It comes together beautifully on the plate. A deeply flavoured, mildly spicy sauce blends with the creaminess of the grits. Meltingly tender pork ribs add a touch of richness. This dish takes Mexican cooking into fine dining territory. The key is slow roasting back ribs in the oven before a quick braise to enrich the sauce. The slow roasting browns the ribs and contributes the always important Maillard flavour compounds (those flavours you can only get by browning your meat). With any other meat you can brown in the pot but back ribs are curved. You can’t brown them evenly. Credit goes to the kitchn.com for the idea to cook the back ribs initially. A solid cookie sheet and a bakers rack lets air circulate around the ribs, promoting browning. The cheese grits are really cheese polenta. You can’t get grits up where I live. But the fine ground cornmeal works well here. You are going for rich, smooth and creamy. No grit needed. This dish plates up easily. Spoon some of the grits in the centre of a plate and place two ribs on the grits. Spoon some sauce around the ribs and you have a dish that puts most Mexican restaurants to shame. Worthy of a dinner party. 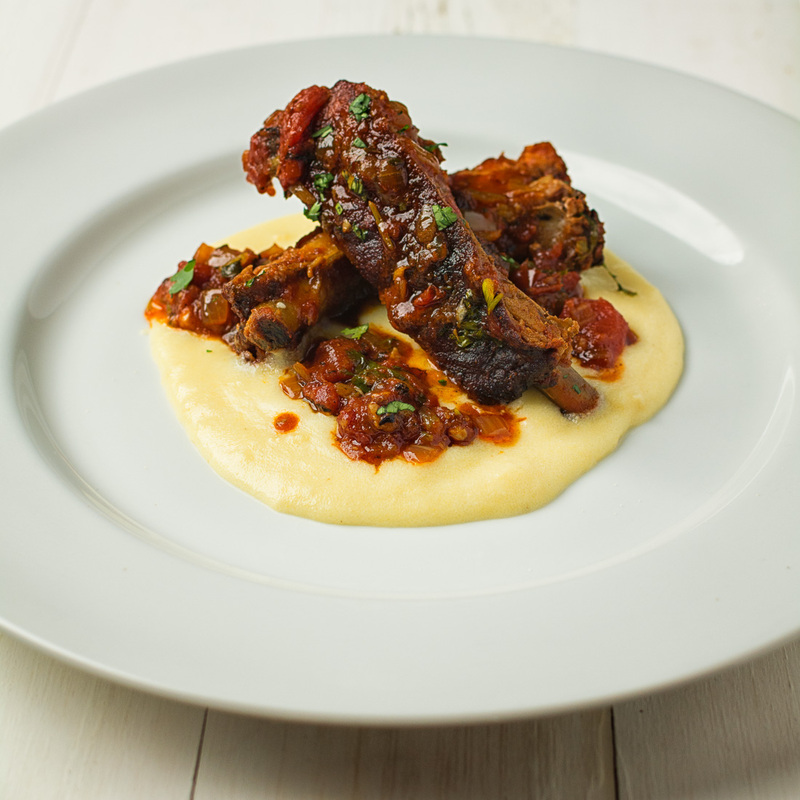 Mexican pork ribs, fire roasted tomatoes, cheese grits. Could be on a menu somewhere. 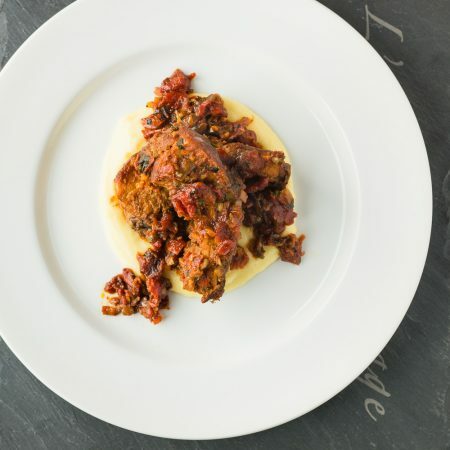 Melting pork back ribs, fire roasted tomatoes and cheese polenta come together in this fine dining riff on Mexican pork chili. Mix pure chili powder, cumin, granulated garlic, granulated onion and salt. This is your dry rub. Remove silver skin from the rib side of the ribs. Insert a knife between the membrane and the rib and lift. Get your fingers under the skin and pull. This is easy sometimes and thoroughly annoying other times. I've never been able to figure out why. Thoroughly coat the ribs with the dry rub. Place ribs on a rack on the cookie sheet, place in oven and slow roast until they reach an internal temperature of about 185F. This can take up to 2 1/2 hours depending on the rack. Measure temperature in the thick parts and between the ribs. Don't let the probe touch bone. That will mess up the reading. While the ribs are cooking prep the sauce. Add oil to a pan and heat over medium low. Add the onion, chili powder, cumin, Mexican oregano and salt and cook until the onions are translucent. Add tomatoes and a splash of chicken stock and simmer around 30-45 minutes, taking care not to let the pot boil dry. When the ribs have reached 185F or so remove from oven and let cool slightly. Slice into individual ribs and add to the tomato sauce. Add the cilantro. Simmer ribs in sauce for about 20-30 minutes. Substitute rendered pork lard for the vegetable oil in the sauce if you can find it. Pure chili powder is not the same as supermarket chili powder. Look for pure ancho or New Mexican red chili powder. These "grits" are a jumble of the top two cheese grits recipes on the web. Use whatever recipe you are comfortable with. Add salt to the chicken stock and bring to a boil. Reduce heat to low. Add cornmeal gradually, stirring to incorporate each time before adding more. Cook, covered, stirring every 3-4 minutes for 20 minutes or until creamy. Remove from heat and stir in butter and cream. The recipe actually uses cornmeal - not hominy grits. In main course, meat, mexican, pork. Bookmark the permalink. Ohhh, this looks sooooo good! I love ribs, but have always relied on trusty BBQ sauce. I like this new take! And I love when I can prepare components ahead of time for a quicker assembly. It let’s me spend time with family and friends instead of in the kitchen! It’s totally different from BBQ ribs. I love BBQ ribs but it’s nice to mix things up. This is a braise. Think pork stew. If you have a chance I’d love to hear how it worked for you. I’m always looking for a good recipe that does not involve smoking or grilling ribs. (We live in an apartment.) This is perfect! And it definitely has a casual/yet gourmet type of feel that is definitely my favorite thing. I’m a huge fan of ribs and a huge fan of braises (especially in the winter). This one is a way I get my rib fix when it’s too cold to make BBQ. Oh my! Meat lover heaven right here. I have never used fire roasted tomatoes before but I think I may need to pick up a can now to try this out! 🙂 This looks so flavour-intensive, I absolutely love it. To be honest I have never had good grits before but I know Terry loves it so I will need to check out these cheesy goodness! Fire roasted tomatoes is an ingredient I started using after watching Rick Bayless’ Mexico – One plate at a time. He uses them everywhere and I really like them in any Mexican or Tex-Mex dish that uses canned tomatoes. Muir Glen are my fave if you can get them. The grits are really just polenta with marketing… Can’t get hominy up north. Loving your recipe for Mexican style ribs, I always, always do bbq ribs. This is a nice change and sound so delicious! It’s a way to get a rib fix in the middle of winter. It’s completely different from BBQ ribs but I like it. Wow, these ribs and grits look incredible! The sauce sounds amazing! Great recipe, Romain! I could definitely see this on a dinner party menu! Well done!